Holding an electronic music festival inside a church might seem to be a strange choice of venue, but in practice it certainly lends a distinctive atmosphere to proceedings. The location of St. John’s Church on Bethnal Green continues a tradition of sorts for the team behind 22rpm (Mango + Sweetrice Records and Bit-Phalanx Music) with previous events staged at St Giles Church. For this year’s showcase, there’s a broad spectrum of artists ranging across many sub-genres, all of which have their own approach to crafting electronic music. It means that while some artists might not ‘float your boat’, there’s always another that manages to capture your attention. The New England-based musician Derek Piotr has a flair for dramatic sound compositions. Kicking off proceedings in the early part of the afternoon, Piotr delivers pieces that consist of percussive collages, often weaving together crashing electronics and choral effects. Stark acoustic percussion strikes out from the composition, meanwhile colourful abstract projections rotate slowly in the background. For other pieces, there’s haunting atonal choirs where the low frequency bass tones resonate through your body. Chittering, glitchy beats make up the ingredients of later tracks. The end result is a striking series of musical pieces that manages to wake up the early attendees in the pews. Elsewhere, the vaults beneath the church have been turned into a space for a ‘silent disco’. Ingeniously, there’s also choices on offer as each set of supplied headphones can switch to a different channel. Those options give attendees the choice of tunes from the likes of bleep.com, Abstract Reflections and EIF (Earth Is Flat). Meanwhile, Howlaround founder Robin The Fog provides the overall background acoustics. Taking their place on the stage upstairs, Andrew Dobson’s Digitonal, along with Dom Graveson, were unfolding their own ‘acoustic-electric’ performance. There’s a warm, immersive feel to Digitonal’s set, with a few nods to trance in the mix. 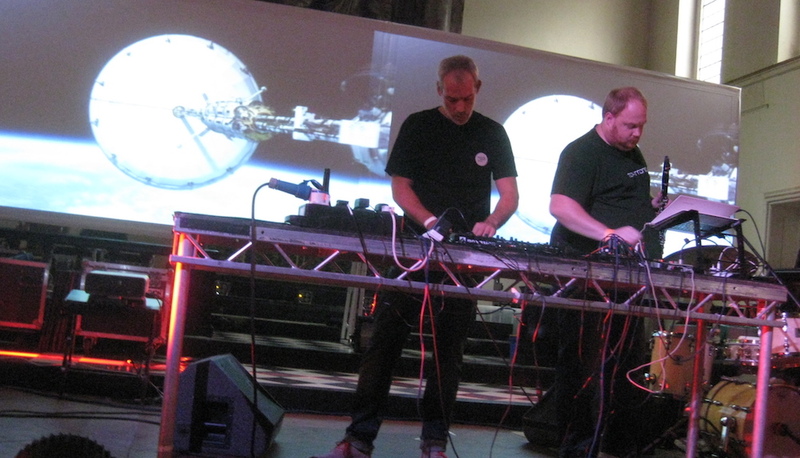 Their ambient electronica is also given a visual punch by the spacey projections behind them, culled from a series of science fiction films, including the classic 2001: A Space Odyssey. The acoustic element is handled by a judicious use of clarinet, although Digitonal’s musical palette can comfortably flit between a breezy pastoral feel and more beats-driven numbers. A warm series of melodic arpeggios and soft clarinet accompanies a cover version of Ochre’s ‘Paper Unicorn’ and the set is rounded off with a new number (Apparently titled ‘Orion’) with a nice combination of muscular beats and icy synths. Some minor initial sound issues aside, Digitonal delivered a melodic set that drew a healthy round of applause from the audience. 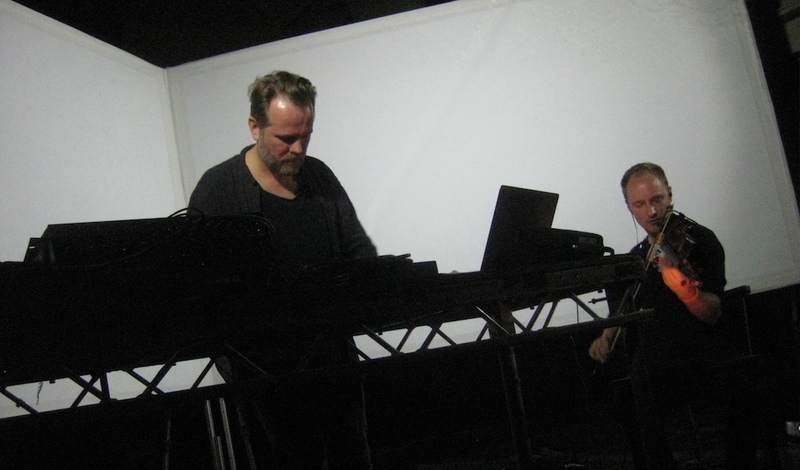 B12 originally emerged as an outfit consisting of Mike Golding and Steve Rutter back in the 1990s, noted for their 1993 album Electro-Soma, released on the Warp Records label (currently on track to celebrating their 30th Anniversary). 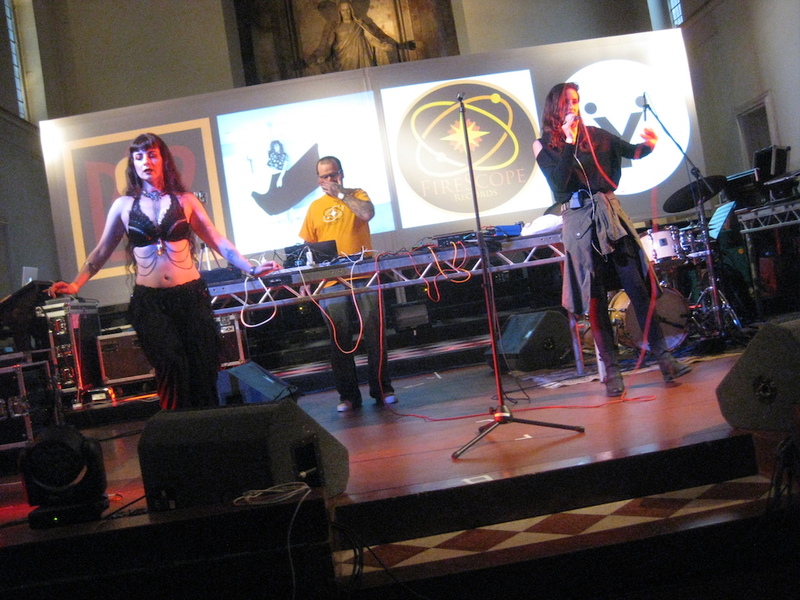 B12’s performance at 22rpm was divided equally between a selection of tunes by Steve Rutter and also by the introduction of singer Bryonii and dancer Ami. There’s certainly a soulful, sultry component to this collaboration augmented by bass-heavy beats and rhythms. Songs such as ‘Chinese Whispers’ have a dubby, stripped-back approach, while ‘Sympathy’ opts for a more seductive, mesmerising vocal. Following B12’s set, the talents of Ulrich Schnauss are employed on DJ duties, offering some captivating floaty electronica. It’s a perfect stop-gap before Coppé takes to the stage. By now, the evening has arrived and the lighting takes on a more intimate mood. It’s a perfect setting for Coppé as she arrives in a fetching outfit complete with puffy shoulders and a pointy-eared hat. Coppé has also come mob-handed for this performance, with a full complement of musicians – as well as regular collaborator Malcolm Chalmers handling the electronic elements. Mango + Sweetrice, the self-owned label that Coppé runs, is also 22 years old this year and she’s run up an impressive catalogue of work over that time. Milk represents her latest body of work, described as a “hip-hop hybrid jazz album” and featuring collaborations with the likes of Nikakoi, Atom™, Kettel, and Chris Mosdell among others. Much of her performance tonight takes on a smooth jazz ambience, particularly with the input of David Brown’s breezy trumpet accompaniment. The inclusion of a cover of Klaus Nomi’s ‘The Cold Song’ is also a nice surprise. Between the vocal elements of some songs, Coppé finds time to enjoy a little boogie, which also offers the audience a chance to appreciate her pop art spacesuit (which is largely obscured for most of the set behind her gear stand). There’s also some intriguing combinations of electronica with the jazz elements, particularly on tracks such as the shimmering ‘Bie Mire Bist Du Schon’ (produced by Atom™ for the Milk album). Scanner (aka Robin Rimbaud) delivers compositions that paint cinematic soundscapes, often with low tonal moods that lend a sense of bleakness. Drawing mainly from his album The Great Crater , rear projections illustrating stark black and white landscapes help to convey a disconcerting mood. Peppered between this are more expressive pieces that employ a barrage of percussion and machine-gun rhythms (which sees Rimbaud hammering away at the controller like a typist from hell). Later in his set, there’s a more ambient piece as projections of floating clouds rise on the backdrop. This transforms into a shimmering landscape of sound and later still into a piece dominated by more martial beats. As an artist, Scanner builds impressive edifices of sound that we’re invited to occupy for brief periods of time. Iranian multi-instrumentalist Ash Koosha offers a setlist of very busy, layered compositions that veer from the euphoric to more rumbling affairs that defy easy niches. While the back projections deliver some strangely unsettling images of an ice cream melting in reverse, Koosha delivers his tunes from a position of shrouded darkness, further giving his performance a cryptic quality. Following up, Manchester-based Bola offer up an initial set of pieces that sound like they’ve been culled from a lost science fiction film. Hot on the heels of recent album release D.E.G., Bola’s alternates between deep bassy compositions that sound like they’ve been pulled up from the ocean depths and more resonating beats-driven numbers. Meanwhile, closing act Valgeir Sigurðsson delivers something entirely different from the entire roster of artists so far. The Icelandic musician, in the company of violist Daniel Pioro, presented a set that drew from most recent album release Dissonance. 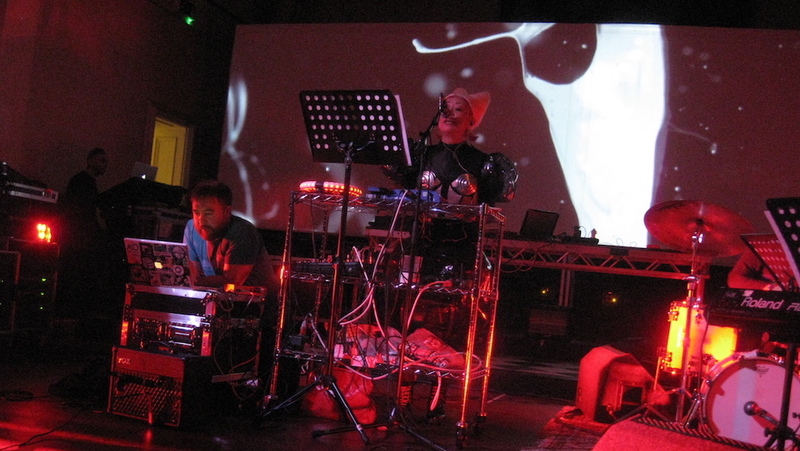 This merging of classical instrumentation and electronics has been a particular theme for other artists of late, resulting in surprising and impressive works, such as Hannah Peel’s Mary Casio outing. Likewise fellow Icelandic composer Jóhann Jóhannsson worked wonders on the sombre tones of Orphee. Equally, Sigurðsson’s material is threaded with a glacial melancholy that suggests icy landscapes and winter moods. Daniel Pioro’s talent for alternating between haunting, evocative strings and frenetic bursts of urgent fiddling give the performance a particular dynamism. Dissonance, as a title, suggests a lack of harmony. But there’s something mesmerising about the music Sigurðsson produces which points to its polar opposite. Ultimately, 22rpm has resulted in an intriguing, often captivating, showcase of electronic music. The ability to also present emerging artists to new audiences is also a bonus – and it also suggests that future events are scheduled to deliver more delights. The Electricity Club extends its grateful thanks to Léigh at Bit-Phalanx. Photos by Paul Browne.